A blend of Jared Diamond's Guns, Germs, and Steel and Simon Winchester's Pacific, a thrilling intellectual detective story that looks deep into the past to uncover who first settled the islands of the remote Pacific, where they came from, how they got there, and how we know. For more than a millennium, Polynesians have occupied the remotest islands in the Pacific Ocean, a vast triangle stretching from Hawaii to New Zealand to Easter Island. Until the arrival of European explorers they were the only people to have ever lived there. Both the most closely related and the most widely dispersed people in the world before the era of mass migration, Polynesians can trace their roots to a group of epic voyagers who ventured out into the unknown in one of the greatest adventures in human history. How did the earliest Polynesians find and colonize these far-flung islands? How did a people without writing or metal tools conquer the largest ocean in the world? This conundrum, which came to be known as the Problem of Polynesian Origins, emerged in the eighteenth century as one of the great geographical mysteries of mankind. For Christina Thompson, this mystery is personal: her Maori husband and their sons descend directly from these ancient navigators. In Sea People, Thompson explores the fascinating story of these ancestors, as well as those of the many sailors, linguists, archaeologists, folklorists, biologists, and geographers who have puzzled over this history for three hundred years. 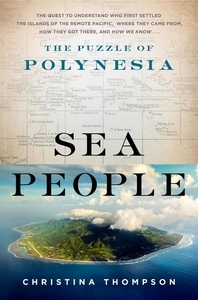 A masterful mix of history, geography, anthropology, and the science of navigation, Sea People combines the thrill of exploration with the drama of discovery in a vivid tour of one of the most captivating regions in the world. Sea People includes an 8-page photo insert, illustrations throughout, and 2 endpaper maps.